You are here: Home / Blog / GlassesOff Beta for Android is here! GlassesOff Beta for Android is here! We’re happy to announce that the GlassesOff Beta app for Android has been officially launched in the Google Play Store. This new version includes the basic elements of the iOS version with a fresh new look and is now available in the Google Play store to download for free! 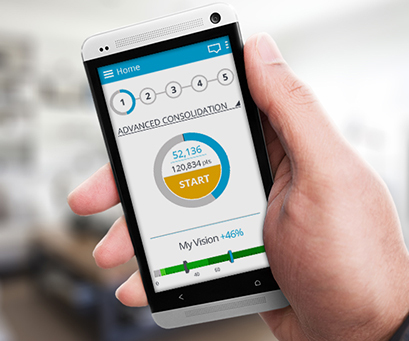 This 1st version supports high end mobile devices and includes our full vision evaluation solution and exercises, allowing users to assess their expected benefit from GlassesOff in just a few minutes. Users with existing GlassesOff accounts on iOS devices can seamlessly switch to Android devices and continue their program by logging in with their same username and password. That’s why we’re crediting all new users with a free 3-week extension to their trial period! We want *you* to see results from GlassesOff! Just complete 5 sessions in the next 2 weeks to activate the extended training period. If you already have reading glasses or multifocals, we strongly suggest visiting our tips center. The homepage is cleaner, simpler and displays the same large circular start button with your score. The training segments now appear in a straight line and each one has been categorized with its own title. If you tap on one of the titles, you will be presented with a short description of that segment’s objectives. Get a snapshot of your progress easily from the homepage in the ‘My Vision’ bar. The first section of the bar illustrates your initial evaluation results and the rest of the bar shows the progress you have made throughout your training program. It’s much easier to understand how you are progressing in the session itself . The Android Beta app’s new look and feel will also be gradually incorporated into our iOS version for our current users’ convenience. 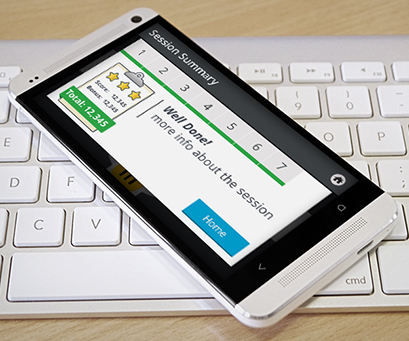 We invite you to download GlassesOff Beta for Android here and look forward to your incoming sessions! Start 2014 in a sharper resolution Tips for Achieving Your Sharpest Near Vision.